The line graph delineates information in comparison to the number of visits to two new music sites on the web. On day 1, one can favourably notice that Pop parade outweighs the number of visit of the Music Choice by having 120'000s vs 40'000s. There is a little fluctuation in Pop parade's visit from day 1 to day 3. It descends from day 3 to day 5. Over a period of 2 days only, the number of visit marks half of the number of visit from the first day. A See-saw trend can be seen as well from the 5th day to the 9th. Interestingly, Pop parade's listeners catapulted to almost 150'000s but then again it fluctuated until the 15th day with an accrued 170'000s number of visit. However, the Music Choice's trend can be described as a roller-coaster ride. From day 1 to day 11, the number of the listeners ranges from 20'000s to 60'000s. Surprisingly, the number of visits rocketed to 120'000s and ends on a downward slope leaving an amount of 70,000s number of visit on the last day. Based on the facts given, people have this commonality on visiting and enjoying listening to Pop parade music over the Music Choice. The line graph delineates information in comparison to compares the number of daily visits to two new internet based music sites. On day 1, one can favourably it is clearly noticeable that visits to Pop Parade outweigh the number of visits of the Music Choice by having 120'000 versus 40'000. There is a little slight fluctuation in Pop Parade's visits from day 1 to day 3. However, they descend from day 3 to day 5. Over a period of 2 days only, the number of visits marks half of the number of visits from the first day. A See-saw trend fluctuation can be seen as well from the 5th day to the 9th. Interestingly, Pop Parade's listeners catapult to almost 150'000 but then again it fluctuates until the 15th day with an accrued 170'000 number of visits. However, the Music Choice's trend can be described as a roller-coaster ride more eratic. From day 1 to day 11, the number of the listeners ranges from 20'000 to 60'000. Surprisingly, the number of visits rockets to 120'000 and ends on a downward slope leaving an amount of 70,000 number of visits on the last day. Based on the facts given, people have this commonality on visiting and enjoying listening it is evident that throughout the period people like to visit Pop Parade over the Music Choice. 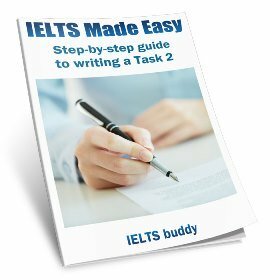 Your answer is good in that it is easy to read and you have clearly divided up the information. There are not too many grammar errors either. However, as I explain below it would benefit from some more comparison between the two sites. ...the number of visits to two new music sites on the web. A few words and short phrases is ok, but this would get deducted from your word count. You can see in the introduction I have changed it. Careful with your tenses - if you look you'll see you switch between present and past tense. With this graph it is ok to use either, as you are not specifically given a timeframe in the past, but you should choose one and stick with it. ...visits to Pop Parade outweigh the number of visits of Music Choice.. However, your answer would benefit from some more direct comparison between the two. For example, pointing out how they started at very different levels at the beginning, they were more similar in the middle, and both increase sharply at the end. See-saw trend /roller-coaster ride = again, these are too informal. 120'000s = 120,000 - no 's'. I got the same graph during my I.E.L.T.S class last week.And our sir dictated it in a different way.He always begins the graph by saying "The ---graph shows/depicts/reveals/indicates/illustrates etc.". moreover,his style of concluding the graph is as follows "To sum up/In brief/To recapitulate/To summarise etc"
What is the problem with the word "delineate" ? 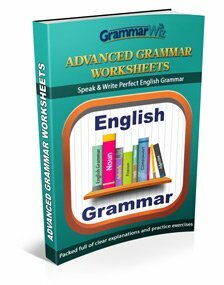 hi I think the word (delineate) means describe or marke the edge of sth such as car park so in the academic task 1, candidate are wanted to report only what he sees. he can not add something from his own. he also can not mark or describe the edge of sth. he must start from the core and report it with a direct language. Hi everyone. i was wondering what the difference between outweigh and outnumber is. Can they be used interchangably? In many cases you can use them interchangeably but not all. If you mention a specific number it sounds it bit odd to use 'outweigh' and you should use 'outnumber'. The men outnumbered the women by 3 to 1. The line graph shows a comparison between the number of daily visits to two new music websites over a period of 15 days. overall, despite some fluctuations, Pop Parade accounted for the highest number of visits in the majority of the time. experienced the lowest numbers of visits, ranging from 30,000 to 45,000,which were closely followed by Musical Choice.However, the numbers leapt to 150,000 on day 11 before it fell back to 80,000 on day 12. Musical Choice, on the other hand,fluctuated at much lower level of 20,000 to 40,000 till day 11, apart from a brief rise on day 3 to 60,000. Surprisingly, it witnessed a six-fold dramatic rise to 120,000 on day 12 and exceeded the Pop Parade for the first time. But it overrode again by Pop Parade by a sharp rise to 160,000 on day 14. Thereafter, the number of visits of Music Choice dropped significantly to low as half of the Pop Parade's number on day 15. This graph shows an analogous data of visits of two music websites recorded within 15 days. 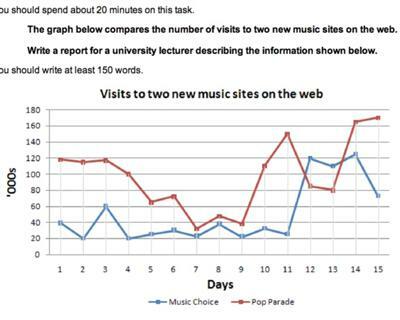 This report compares the information given in this line graph about these two music sites i.e., Music Choice and Pop Parade. Overall, both music sites have reported an increase in visits by web users on their websites. However, Pop Parade music site has lured more net visitors than music choice in these 15 days. 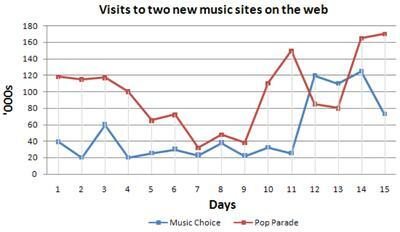 As shown in graph, Pop Parade had beginning with more 80,000 visitors from Music Choice and also attained 170,000 visitors which was much greater than Music choice ending visitor score. While, Music Choice had 40,000 visitors at starting and then it procured 70,000 visitors at the end of fifteenth day. Music Choice had obtained sudden increment in third and eleventh day. But, it got again steeped down some margin twice and caused net growth of 30,000 visitors in these 15 days. On the contrary, Pop Parade also had decrements, one with long time fluctuations for 6 days and other with sudden fall. But, it burgeoned with large margin in comparison with previous decrements and entailed overall 50,000 net visitors. 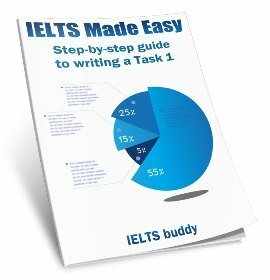 i have a question regarding counting words in a essay, i know they need 150 words overall in task one but i want to know if i repeated one word in many places, is it acceptable for counting. Yes that is fine. You could write the same word all the way through and they'd all get counted, but of course you'd get a very low score! The graph below compares the number of visits to two new music sites on the web. 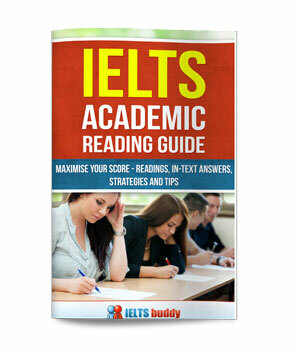 Write a report for a university lecturer describing the information shown below. You should write at least 150 words. The line graph shows the amount of visits received by two music websites, Music Choice and Pop Parade, in a period of 15 days. Overall, it is clear that the most visited website is Pop Parade, but for few days the trend was switched. Going to detail, Pop Parade visits at day 1 accounted as 120k, much higher than Music Choice, with only a third of the visits (40k). At day 3, Pop Parade registered a steady decline in visits, but still more than the ones received by Music Choice, which reached a peak of 60k visits. Pop Parade continued its erratic decrease until day 11, when a sharp growth reached more than 140k visits; in the same period, visits for Music Choice fluctuated between 20k and 40k views. After day 11, Pop Parade’s popularity fell to 80k visits for two days, whereas Music Choice resulted to be the most favourite website. Finally, from day 13 to day 15, Music Choice plunged to reach nearly 70k views; on the contrary, Pop Charts suddenly rose to reach just over 160k visits, continuing a constant increase at day 15. You can provide feedback on this graph about the number of visits to two new music sites on the web and help the candidate improve their score by clicking the comments link below.